The National Historic Landmark Harada House is a powerful civil rights landmark in California. This site and the story of the Harada Family embody local, state, national, and international issues of civil and individual rights, democracy, immigration, assimilation, and citizenship. Preservation of the site, collections, and stories ensures that these pivotal lessons of history will continue to be accessible for all peoples. Jukichi Harada, his wife Ken, and their first son Masa Atsu, settled in Riverside, California in 1905. They soon were operating a rooming house and the Washington Restaurant. Following the death of his first American born son, Jukichi sought a home with healthier conditions for his family. 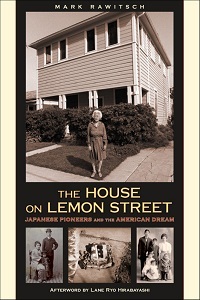 Aware of the 1913 California Alien Land Law prohibiting aliens from owning property, in December 1915 he purchased the house at 3356 Lemon Street in the names of his three American-born children, Mine, Sumi, and Yoshizo. He prevailed in a landmark court battle to retain the home. The book is available at the Riverside Metropolitan Museum Gift Shop.